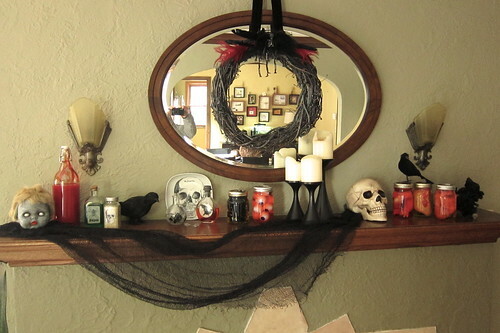 I had so much fun decorating our mantle for Halloween this year. I went a little crazy at the dollar store (if you can call $12 crazy), used stuff I had around the house and laughed an evil laugh the whole time it was coming together. I guess I would say my theme is mad scientist. I love all the little vignettes I created across it. This might be my favorite part. 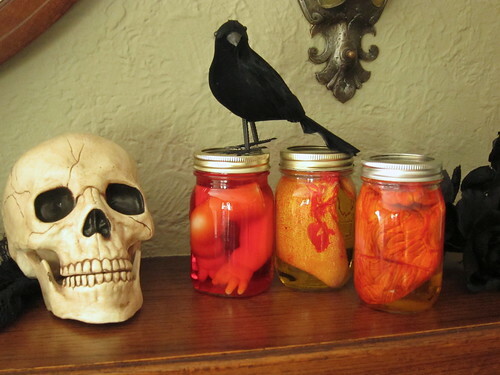 I found plastic hearts, livers and eyeballs at the dollar store. The arms are from a thrift shop doll. 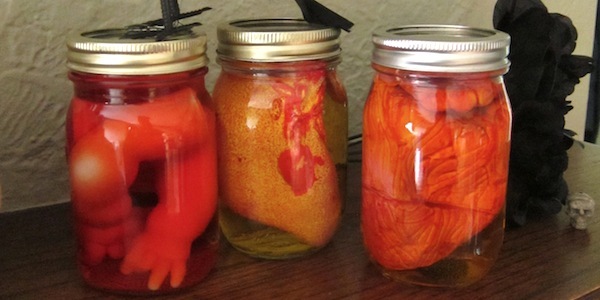 I shoved them into canning jars I already had, then added water and either red or yellow food coloring. The bird is also from the dollar store and the skull is from Target. On the other side of the mantle is my zombie baby head. I’ll post about how to make it later. Next to the head is a bottle of “blood.” Red food coloring in water isn’t blood-like enough for me, so I add some milk to make it more opaque. You want to do this in a sealed jar because it will start to smell. 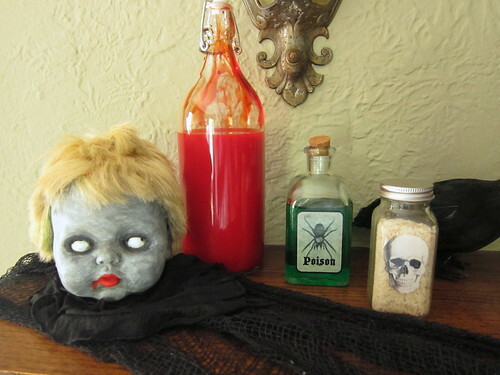 The skull bottle has rice in it to represent maggots. I’ve collected all the different shape jars over the past couple of years from Michaels, JoAnn and the dollar store. The black “spooky cloth,” as they call it, is from the dollar store and comes in black and grey. Here you can see the eyeballs in a jar as well as a jar of plastic spiders. The jar with the bug on it has plastic bugs in it. 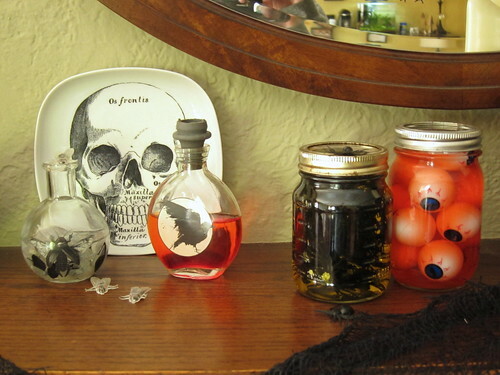 I made the skull plate and added the designs to all the jars last year using water slide decals. You can get the instructions here. The whole mantle is topped off with a wreath which I will also show you how to make in another post. What kind of Halloween decorations are you planning for this year? 7 years ago by Kat in Crafts , Halloween , Holiday | You can follow any responses to this entry through the RSS feed. You can leave a response, or trackback from your own site.